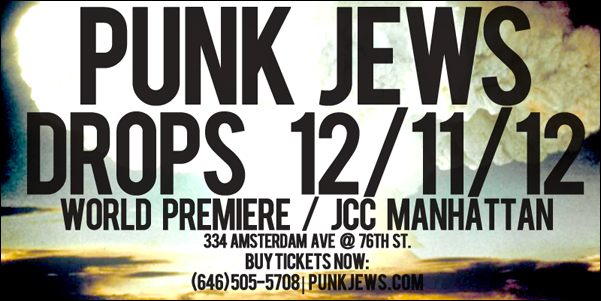 The film Punk Jews, which I Co-Produced, is having its official World Premiere on December 11th, 2012 at the JCC of Manhattan. There will be two screenings, at 7pm & 9pm, both of which will feature a Q&A after the film with myself, producer Evan Kleinman, and director Jesse Zook Mann. I look forward to seeing you there! Head over to to PunkJews.com to buy tickets and see updates about future screenings. Punk Jews Trailer from Evan Kleinman on Vimeo. Punk Jews documentary trailer 2011 from Evan Kleinman on Vimeo. Posted on Wednesday, October 24th, 2012 at 9:30 pm. Filed under: New Work	RSS 2.0 feed.